Are car problems interfering with your busy schedule? Deal with car repair issues quickly and affordably by visiting us for auto repair in Westerville, OH. Whether your car needs an oil change, brake service, or major engine repair, you can trust our ASE-certified mechanics for prompt, top-quality, and affordable vehicle repairs. Even though the problem may be a concern for you, it's no problem for us. We'll address your concerns, because we can fix any vehicle issue. Dedicated to providing unparalleled customer services and reliable auto repairs, our local auto repair service is a name you can trust. 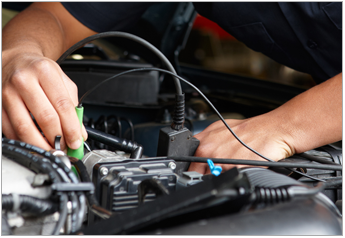 Our experienced auto mechanics are at your service whenever your car needs special attention. Committed to automotive service excellent, our ASE-certified technicians are the best of the best. Our mechanics have undergone extensive training and testing to receive their ASE certifications. Enjoy peace of mind by depending on our highly skilled auto repair experts. Due to our high quality and affordable services, our local car repair shop has earned and excellent reputation in the community. We have proudly served the area since 1999. Big auto dealers may service your car, but they often do not provide personalized services and affordable rates. When you rely on our experienced local auto mechanics, we strive for your 100% satisfaction on all levels. In fact, we guarantee it! We proudly offer payment financing options as well. In addition, you'll find that our mechanics are friendly, professional, and highly skilled. Find out what's wrong with your car at our at our auto shop. We offer modern innovation in a friendly, worry-free environment. In fact, we use top-of-the-line technology and state-of-the-art auto diagnostics equipment to identify problems with your vehicle. Afterwards, we conduct reliable and affordable repairs. Contact us for domestic and foreign auto repairs when your vehicle is suffering from the rigors of the road. We serve vehicle owners from Westerville, Columbus, Worthington, Gahanna, and New Albany, Ohio, as well as the surrounding areas.